The following originally appeared on Global Sisters Report. Full disclosure: I was on the bus for only the first and last weeks. In total, it was a marvelous, enriching, depressing, heartening and exhausting pilgrimage of 21 states, 27 days and 54 events. I can’t imagine how the Network staff managed for the full four weeks. It’s hard work! But here’s some good news. There are lots of concerned and caring people across our country who are worried about what the 2017 Tax Cuts and Jobs Act will do in the long run to most U.S. taxpayers, especially the most vulnerable. The people who weren’t worried? Well, we even converted a few of them. Most of the politicians we tried to see refused to meet with us. Were they embarrassed? A fitting symbol for those politicians was the cardboard cutout of U.S. Rep. Rod Blum that his constituents in Iowa’s 1st District brought to the Oct. 17 Cedar Rapids rally. They said they bring the cardboard version of Blum along to these gatherings because he never makes himself available to them. Along the journey, we educated people about the U.S. tax policy. The best educational tool we used was a visual representation that Network staff designed, which I described in a previous blog. 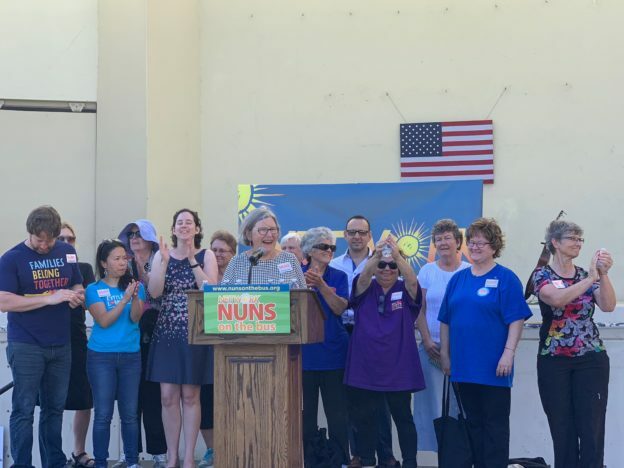 The Nuns on the Bus acted out a human bar graph, taking the role of real people who represent each economic quintile, including the top 1 percent, and corporations. That’s why we chose to end with a demonstration at Mar-a-Lago, President Donald Trump’s private golf club and resort, an icon of inequality. The site visit to a multi-story affordable care residence for elderly people of limited financial means run by the Elderly Housing Development & Operations Corporation underlined what we had heard all along our four-week trip: the need for affordable housing and health care. Like others, this pleasant residence, which boasts a beautiful view from the 10th-floor laundry room, is endangered from effects of the tax bill and has a waitlist of hundreds of people. Most will die before they can move in. On Nov. 2, we awoke to a lovely warm day for our slow drive by Mar-a-Lago and gathered at a park with another bus that had been on the road for six weeks, educating people about health care, and many decorated private cars full of people joining us in our protest, some who came from faraway states like Minnesota. We couldn’t call it a parade because we could not get a permit. As Social Service Sr. Simone Campbell said, it was just a few vehicles that just happened to be all going in the same direction at the same time. It was punctuated by a few random honks from car and bus horns. Some local politicians and Adrian Dominican Sr. Carol Coston, the first executive director of Network, joined us. All 10 Nuns on the Bus got out and walked in front of the bus for a few blocks right across the bay from Mar-a-Lago. We paused to yell encouragement to some construction workers and to send a blessing of positive energy and love across the water to the 1 percent at Mar-a-Lago. As we crossed the bridge to Mar-a-Lago, we kept an eye out for police, but the only ones we saw along the way seemed to be there to help us safely turn back on the main road by stopping the other traffic. We sent a blessing their way, also. Returning to Meyer Amphitheatre in West Palm Beach, we carried the posters from every town hall expressing the problems and solutions the participants suggested. Akron, Las Vegas, Chicago: You were all there with us. And we were all greeted by a mariachi band, lots more supporters and a “Fiesta for the Common Good,” which featured a potluck feast, some wonderful speakers and groups of protest singers like the Raging Grannies. We returned to the hotel, sent our beloved bus and its driver, Glenn, back to Nashville, and said our tearful goodbyes to our fellow nuns and the Network staff. What a talented group, including the staffers on the bus, the advance team that drove before us to set things up, and the ones back in the Network office we didn’t get to see! The opportunity to work with the Network staff and the sister volunteers. Wow. Friends for life. The individual people I talked to in the cracks at site visits, after town halls, at the bus-side rallies after visits to congresspeople. People concerned about justice. The joy and the hope on the faces of the crowds who met the bus. It replaced the fear and anger in their hearts, at least for a day. The AFL-CIO workers who brought us a cooler of drinks for the road and the commitment, energy and enthusiasm of Culinary Workers Union Local 226. My lessons: Don’t give in to the idea that good is not winning in the end! Collaboration is everything! And from Homeboy Industries in Los Angeles: God is a God of second chances! I will also remember a few specific pleasures: finding grits and collard greens on the menus. Watching the vegetation change from saguaro cactus in Arizona to Spanish moss in the South. Our prayer together in the morning. Of course, there were a few minor annoyances, like one sister who said she was surprised to find such creative things happening in the South! This entry was posted in Front Page, NunsontheBus2018 on November 5, 2018 by networklobby. This entry was posted in NunsontheBus2018 on November 2, 2018 by colleen. Early this morning, on this feast of all Saints, we gathered near the water for our contemplative prayer. As always, the prayer time together fueled our journey for the day. Along the road to Mar-a-Lago we have heard over and over again the concerns for adequate, affordable housing. The Elderly Housing Development and Operations Corporation responds to those concerns as a developer and manager of affordable and safe housing for seniors across our country. The EHDOC supports federal policies that advocate for benefits and the highest quality of life for seniors. We had the privilege to visit one of the EHDOC sites in Miami, Florida where we learned from Steve Protulis, President and CEO, and Gwendolyn Mazyck, manager, that no money is availlable for seniors with limited income. The EHDOC has 8 buildings in Florida, housing and providing services for 900- 1,000 seniors. Applications for subsidized housing were recently opened up and two thousand people lined the street beginning at 5:00 a.m. This was just for applications as there were no vacancies at the time. The average wait for affordable subsidized housing for seniors is currently 4-8 years. The tax law with its increase of debt threatens this life-giving program with a loss of much needed funds. The highlight of our visit was the time spent with the residents who greatly appreciated the housing opportunity and services provided. We were treated to a Latin lunch. It was not unusual to be sharing a table with a person originally from Peru, one from Argentina, one from Cuba, and another from El Salvador. The group translations all included Spanish, English and Russian. Curbelo, U.S. Representative for Florida’s 26th Congressional District. 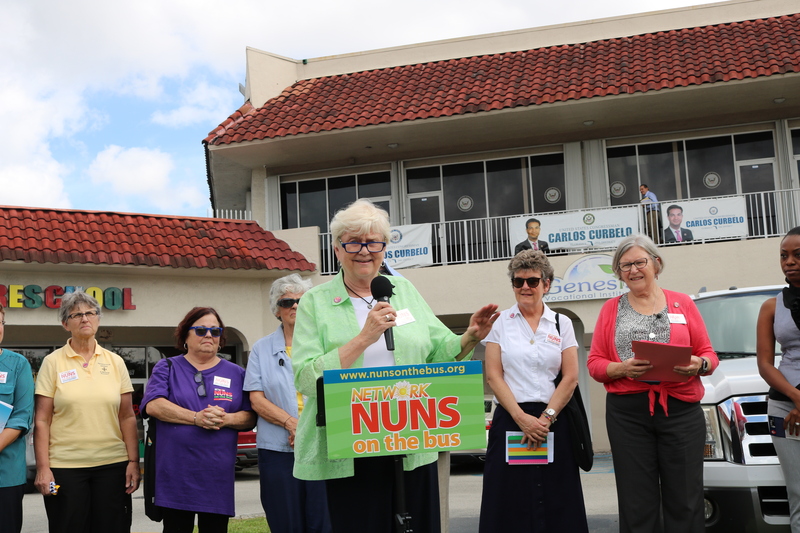 A few of the Nuns on the Bus joined three of Curbelo’s District constituents for a lobby visit – Daniel Gibson from Allegheny Franciscan Ministries, France Francois, and Lorenzo Canizares. We inquired why Representative Curbelo’s rhetoric of care for the people and their needs did not match his voting record. He had voted yes to the Tax Law even though it shifts money to those at the top of the economic ladder and threatens programs vital to his people. His rather defensive DC aide (arriving 20 minutes late) defended Curbelo’s vote with statistics highly questioned by those present. Sister Simone was prepared with data affirming the need for our Tax Justice Truth Tour. After the lobby visit, an enthusiastic group gathered for a rally. All of the speakers urged those present to hold their elected officials accountable and to take their values to the ballot box next Tuesday. View more photos from NOTB 2018: Elderly Housing Development and Operations Corporation Site Visit and Rep. Curbelo Lobby Visit on Flickr. This entry was posted in Front Page, NunsontheBus2018 on November 1, 2018 by networklobby. 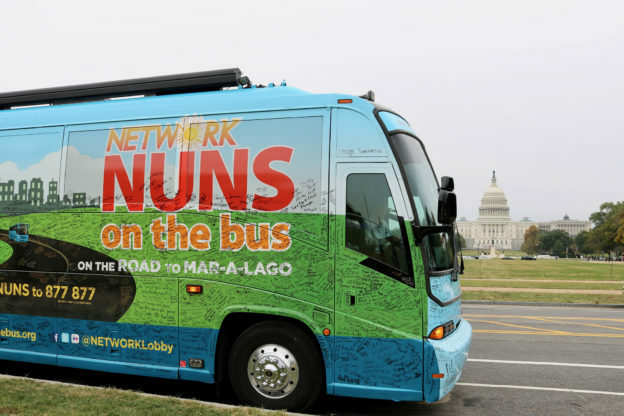 This entry was posted in NunsontheBus2018 on November 1, 2018 by networklobby. On this beautiful, sunny day, we rolled into Apopka, Florida to visit the Hope CommUnity Center. Hope CommUnity Center is a service learning community dedicated to the empowerment of Central Florida’s immigrant and working poor communities through Education, Advocacy and Spiritual Growth. 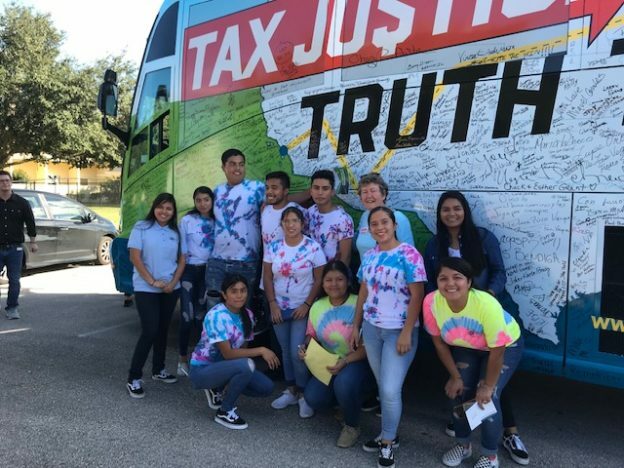 When we stepped off the bus, we were greeted by a throng of joyful young people who were holding justice-advocacy signs in the shape of mariposas (butterflies). Sr. Ann Kendrick, the Director of the Center, asked the young people to take us by the hand as they led us to the Campesino Gardens. Salvador, a six foot young man took my hand and as we walked, he shared his desire for immigration justice. At the Gardens, we saw that people of color can access fresh food and engage in respect and reaping the earth’s bounty. We then proceeded to the Center’s main building, where the signs were placed in the front of a room and we were invited to sit. Sr. Ann emceed the conversational portion of the visit and we learned of the various services provided at the center. We were treated to a visual rendition of the plight of DACA (Deferred action for Childhood Arrivals) recipients performed by local teens. Their humble, raw emotion was profound and their displayed experiences were jarring. My heart broke as these young people taught us so much about the trauma of rejection and parental abandonment by deportation. Still, I felt joy because they were able to deal with unjust pain in a creative, honest and hope filled way. In that sense, we should all be so blessed. The Center also provides social services for aspiring immigrants, students and unaccompanied minors. They partner with several local businesses to empower the immigrants they serve. For instance, we learned about the credit union that accepted good character as collateral instead of possessions and the health clinic that treated everyone with dignity. Hope CommUnity Center has created a community that values every person and restores the dignity that God intended for all of us to live. Hope Center is precisely what it claims to be. Afterwards, we held a press conference where Sister Simone summarized the visit. Sr. Beth LeValley, a Sister of St. Joseph, shared her impressions of the holy ground upon which we stood. Other members of the community reiterated their programs and dreams for an equitable economy. Everyone was struck by the compassion, collaboration and community that the Hope Center displayed. After the speech portion was over, the young people found creative means to sign the bus. Everything these kids did or said was founded in hope and joy. As we drove away, I was happy to know that the next generation coming up is going to be proud, joy filled and creative. They are going to need to be. This entry was posted in NunsontheBus2018 on October 31, 2018 by networklobby. 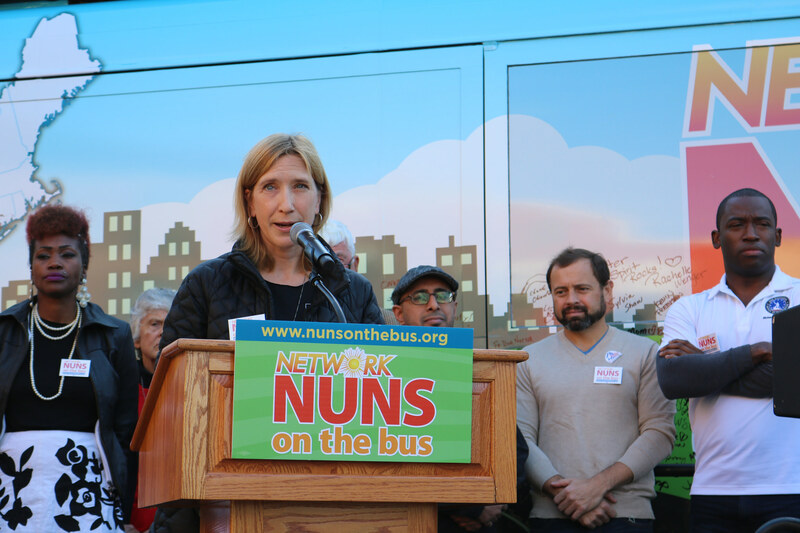 This entry was posted in NunsontheBus2018 on October 31, 2018 by lindsay. This entry was posted in NunsontheBus2018 on October 30, 2018 by networklobby.